I got tired of having paper items (receipts, coupons, business cards, etc.) get crumpled at the bottom of my purse, so I invented this Pocket Purse Organizer to keep everything tidy. It’s sturdy chipboard foundation is held together with Tyvek hinges and wrapped in wallpaper (which is more durable than regular crafting paper). Coordinating craft papers were used to make the pockets and pouches that hold pen, chequebook, passport, coupons, cash, coupons, business cards and more. There’s even a spot for bandaides! In this class, participants pick between two different sizes of Pocket Purse Organizers: a smaller size (which fits more compactly in most purses) and a larger size (which accommodates chequebook and pen). Participants use 3 sheets of 12 x 12″ paper, and one sheet of wallpaper in the colours of their choice. The detailed instruction sheet shows step-by-step how to make either size, using the configuration of pockets and holders that you choose. 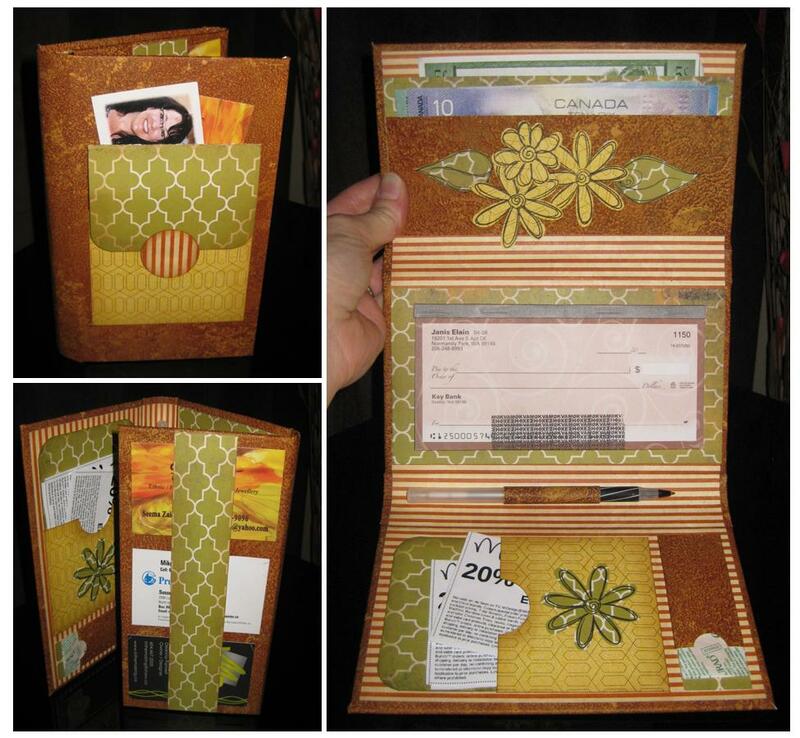 Not only is this Pocket Purse Organizer great to keep yourself organized, it also makes a wonderful gift! Can’t wait for the class! You are so creative !